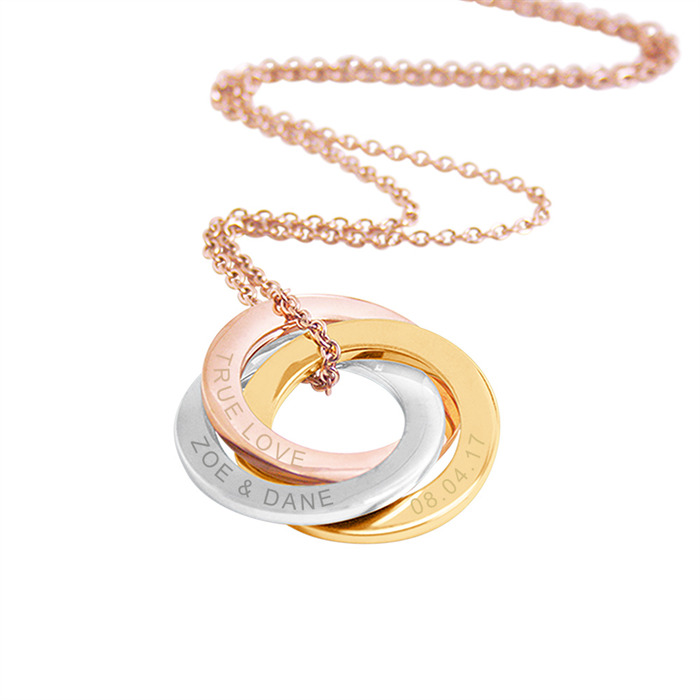 This gorgeous family pendant features 3 interlocking links with a silver, rose gold and yellow gold finish. 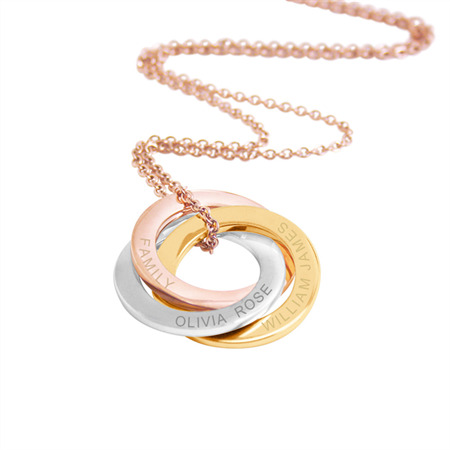 Each ring can be engraved with text of your choice such as children’s names, birth dates, roman numerals or inspirational words, etc. The stunning, classic design makes it the the ideal gift for birthdays, anniversaries, Mother’s Day, Christmas or Valentine’s Day. Or even as a special treat for yourself. Each ring of the pendant is 30mm (approx 1 3/16”) in diameter and approximately 4mm wide (5/32″). It hangs freely on a 61cm curb link chain (approx 24″) and will be presented in a jewellery gift box with a complimentary polishing cloth, ready for giving. The pendant and chain have been crafted from high quality stainless steel with ion plating which ensures a long lasting polished finish. Please note that each piece has been hand cast so some minor differences in sizes may occur, making each piece truly unique. Any imperfections are considered a characteristic and not a flaw. Please include the following information in the message to seller section upon checkout or send us a message with the details. - Text required on each ring (up to 20 characters, including spaces): rose gold, yellow gold, silver (clearly stating which text should be on which ring). * Please double check your information carefully as I cannot offer refunds or free replacements on custom items that have been made if the incorrect details were supplied. This product will be custom made especially for you and shipped from Melbourne, Australia. ** All INTERNATIONAL ORDERS (outside Australia) will be shipped via Standard airmail (shipping time of 2-3 weeks), please select International Tracking upgrade for a faster shipping method (shipping time of 4-12 business days) or Express Courier (shipping time of 3-8 business days). Please note these are estimates only and DO NOT include any unexpected delays due to customs. PayPal is preferred, payment must be made within 48 hours of purchase.